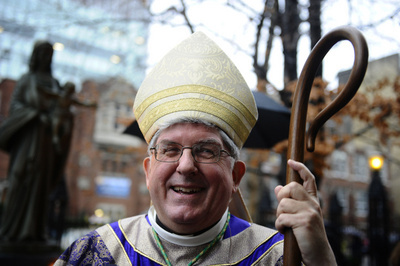 As we all know, especially here in the Archdiocese of Toronto, we are in Rejoice mode! We are celebrating Canada’s Newest Cardinal, Guelph’s own Thomas Collins! Neil MacCarthy, via The Archdiocese of Toronto’s Blog – linked to as Around the Arch, catchy name – has shared the public celebration schedule. The Diocese of Hamilton is also planning a similar celebration in the new cardinal’s hometown of Guelph for later in the month. As you can all imagine, Guelph is quite proud! And rightfully so. […] a remarkable intellectual, a compelling interpreter of scripture, a terrifically engaging personality, a natural leader and among the most humble individuals one might meet. And I totally agree! I have been Blessed with the opportunity to meet His Eminence on various occasions and each time he greeted every single individual with such an open, interested, kindness that would leave me flabbergasted! In Spanish we would simply say que es Bien Sencillo. He is quite modest, unassuming. And yes, quite engaging indeed. Jot down the dates and let us all celebrate one of the newest Holy Father’s Circle of Advisers, Cardinal Thomas Collins. St. Joseph, Pray For Us. Day 1. My hubby and I went to a conference where Cardinal Collins was to say mass. We arrived and got our seats and I spotted him sitting quietly praying as others zoomed around setting up for mass. We kept peeking over – he looked so comfortable, so relaxed, so open to what was around him. I have read several of his letters and that same welcoming, engaging quality comes through in his writings. We are all very excited about his new post – in times like these we need strong leaders!